Washington’s natural beauty is at its peak during the fall. The town’s cascading landscapes become infused with vibrant reds and yellows as the air turns crisp and cold. 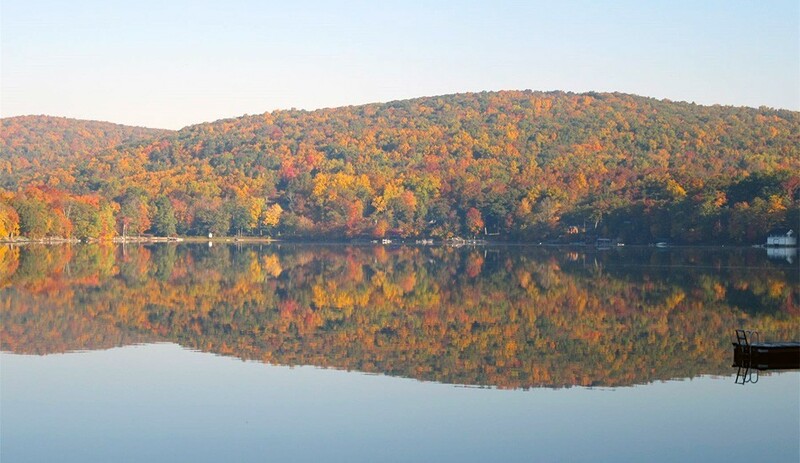 These beautiful colors not only help to illuminate the waters of Lake Waramaug and the Shepaug River but also enliven all of the scenic roads that run through the town. Washington’s spectacular foliage is truly unparalleled throughout New England and can be admired from vantage points in each of the five villages. In fact, Washington is cited by US News & World Report as one of the fifty towns across America with the most gorgeous fall foliage. The best place to admire the foliage in the Washington Green is at the Steep Rock Preserve. As you follow the Tunnel Road Walk in the preserve, you will be overwhelmed by all of the beautiful colors. Don’t forget to visit the Steep Rock Summit which provides visitors with a picturesque view of the foliage around the Shepaug River. New Preston Hill Road and Lake Waramaug State Park provide great views of the fall foliage within New Preston. You can take in the area surrounding Lake Waramaug on foot and by kayaking, canoeing, or paddle boarding on its waters. Or, you can simply drive along East Shore Road towards Tanner Hill to catch a glimpse of the foliage around the lake as well as in the surrounding hillsides. Also, The Lookout within Macricostas Preserve offers some beautiful views of Washington’s foliage. The scenic roads that run through Washington Depot are lined with some fantastic foliage. Anywhere you look, your gaze will be met by bright colors mixing with the architecture of a rural neighborhood or the green of farmland. If you are planning on taking a drive through the Depot area, be sure to check out the foliage on Baldwin Hill Road. Further, The Pinnacle summit and the Henry David Thoreau footbridge at Washington Depot’s Hidden Valley Preserve are excellent spots to catch the foliage around the Shepaug River. Driving along route 202 is the perfect way to enjoy the foliage of Marbledale. Beautiful reds, yellows, and oranges can be seen on both sides of the road and the openness of this area allows for clear views of the surrounding trees and farmland. Mount Tom State Park is bursting with color when the leaves begin to change. The view from the top of the park’s Mt. Tom Tower is truly breathtaking as you can see the neighboring hillsides and the foliage around Mt. Tom Pond.